I have leaky eyes today, pals... The last of the shuttle launches is scheduled for today at 11:26 AM EDT. I'm wearing my space suit until the launch, just in case they need me as an alternate. I'm also wearing it out of respect for all those hard working people at Cape Canaveral. I'm gonna miss the excitement of the launches, that's for sure. So, they are predicting rain, but we're still hoping the launch will go off as scheduled. I'll keep you up to date on that on Twitter. 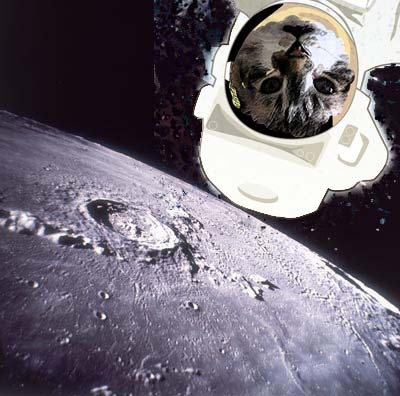 Everybody have a great day and send strong purrs to the space program. Wow do you have a spacesuite ??!! It certainly is an historic day! Mom feel sad that the space shuttle program is ending. Godspeed, Atlantis!! We hope all goes well. We are a little sad that the shuttle program is ending. Awwwwwwwwww, Max, we are purring that they will need you as an alternate.....especially as this is the last chance. Max, what in dog's name are you doing up in space!? You're a cute astrocat! We watched the launch on TV and are sad that there won't be no more. It is rather sad isn't it. It is most certainly a historic day. Mom said in her lifetime she remembers the first launch, the first walk on the moon and now the last launch.....she is older than dirt too!! Max, I think I saw you on the news! It's an historic day and very sad that the space program is ending. Mom had leaky eyes when she watched the shuttle launch this morning. She also had leaky eyes when she watched the close out crew on the NASA channel. They had some touching signs to say goodbye to the program. Hooray, the launch went well, thanks to all your purrs and prayers and help Max!!! Yep, sad it is ending fur sure! Even though we do not live close, we will miss the space missions, too! It's the end of an era, that's for sure. I hope you get called up. We're very sad too. My mum even went to Space Camp. She loves sci fi and wanted to be an astronaut. Have a safe trip!